Long Beach Police Chief Robert Luna and colleagues visited first graders at Muir Academy last week to share Halloween safety tips along with reflective trick-or-treat bags, glow sticks and treats. Tips from the chief and Long Beach Police Foundation President Bruce MacRae included staying in well-lighted areas, never going out alone, carefully checking treats, carrying a flashlight, and refusing to enter strangers' homes. The Police Foundation and Domino’s Pizza sponsored the visit and goodie bags. Chief Luna also encouraged the students to stay in school and do their homework. “When I was your age, someone in uniform came to my school, and I said ‘that’s what I want to do.’ I see a lot of people here who could do this job,” Luna told the inquisitive students in teacher Lisa Carbullido’s class, which is part of the first grade multi-age program at Muir. 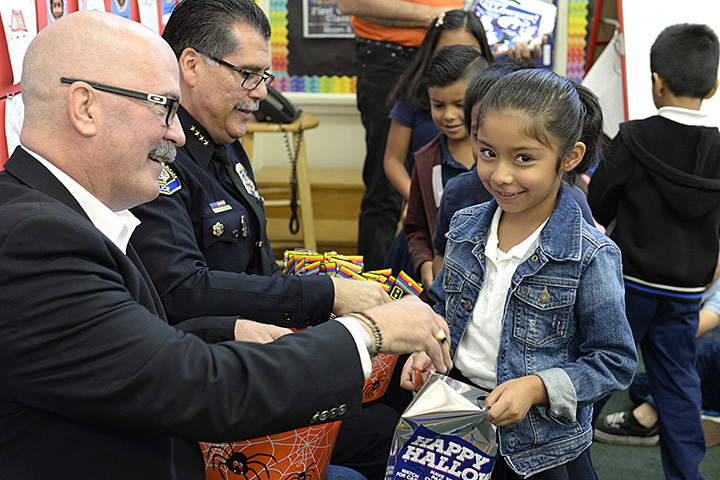 TIPS, TREATS – Long Beach Police Foundation President Bruce MacRae and Police Chief Robert Luna hand out goodies and reflective trick-or-treat bags to first graders at Muir Academy after a talk about Halloween Safety.